The town of San Mateo del Mar is an indigenous community in Oaxaca where the majority of people speak the Huave language (with Spanish as a second language) and the women almost exclusively wear traditional dress, most commonly in deep red and purple colors. The state of Oaxaca is filled with indigenous pueblos of a variety of different ethnic and language groups. But what make San Mateo del Mar unique is that it is located on what is essentially a 4-kilometer-wide sand bar separating a huge lagoon from the Pacific Ocean. When the earthquake hit last September, San Mateo del Mar suffered terrible damage. Residents reported running out of their homes during the quake only to find the ground opening up and water surging up from the sandy soil. Much damage was done, but things could have been catastrophically worse if the earthquake had produced a tsunami. San Mateo del Mar on the Pacific Ocean. Fuentes Libres, A.C. has served in the municipality of San Mateo for more than five years through two groups of women’s community banks. In the immediate aftermath of the earthquake last September, there was a compassionate outpouring of care for towns throughout the Isthmus region, including San Mateo. Fuentes Libres, the Covenant churches in Oaxaca city and others came together to unify their response. They gathered donations of food, water and clothing and loaded everything in vehicles to distribute in San Mateo. A grant from Covenant World Relief helped offset some of the costs for transportation and additional supplies, but the majority of the donations came from local people. It was a chaotic time in San Mateo — just four days prior to the historic earthquake, the municipal president had been assassinated, leaving the community without central leadership in this time of crisis. This meant relief efforts lacked organization and at times even created conflict among the residents. 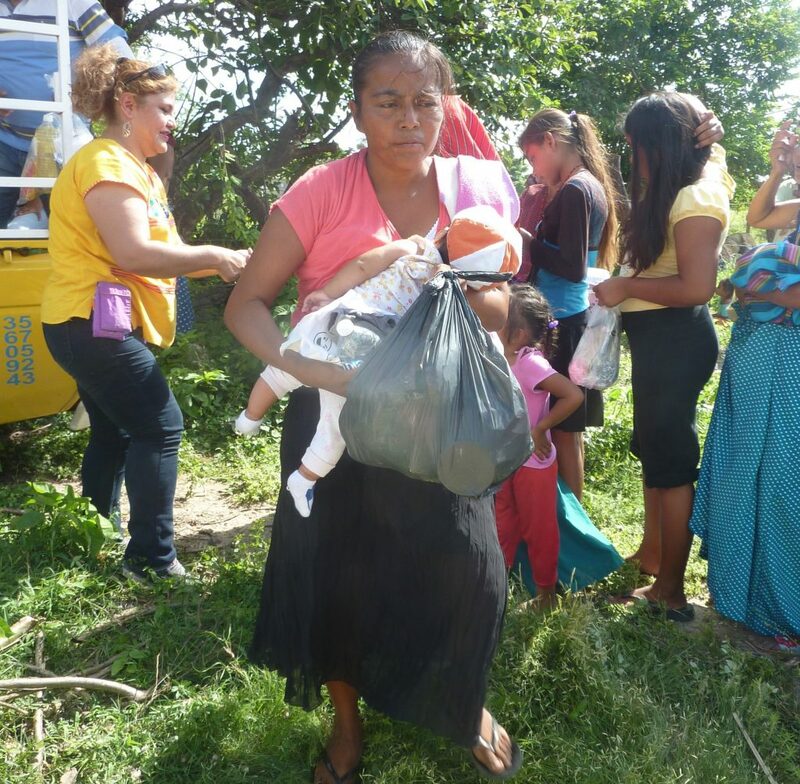 Thankfully, because of the relationships built over time by Fuentes Libres staff members with the women who participate in the banks, they were able to do an admirable job of organizing the neighborhoods where they worked and distributed aid in an orderly and dignified manner. Distributing dispensas — packages of basic food and hygiene items — in September, 2017. In the weeks that followed, the government was able to establish more order in San Mateo and large organizations such as World Vision provided much need support to the area including organizing food dispensaries and activities for the kids who didn’t have school for almost 4 months while temporary classrooms were constructed. 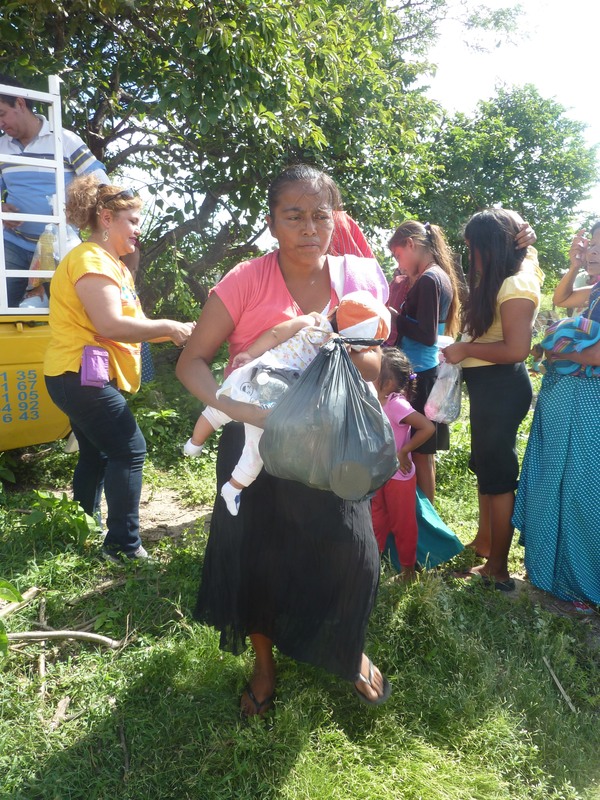 Now, six months removed from the earthquake, the NGO’s have largely pulled out of San Mateo and the government’s role is essentially the financial assistance of $120,000 MXN (about $6,500 USD) given to each family whose home was severely damaged or destroyed. Fuentes Libres, however, is committed to continuing to serve this community over the long haul. This begins with their two community banks (about 25 women in total), but with the vision that whatever intervention would extend beyond to the greater community. With this goal, a small group went to San Mateo for 3 days in April to conduct a community analysis with the women from the banks. 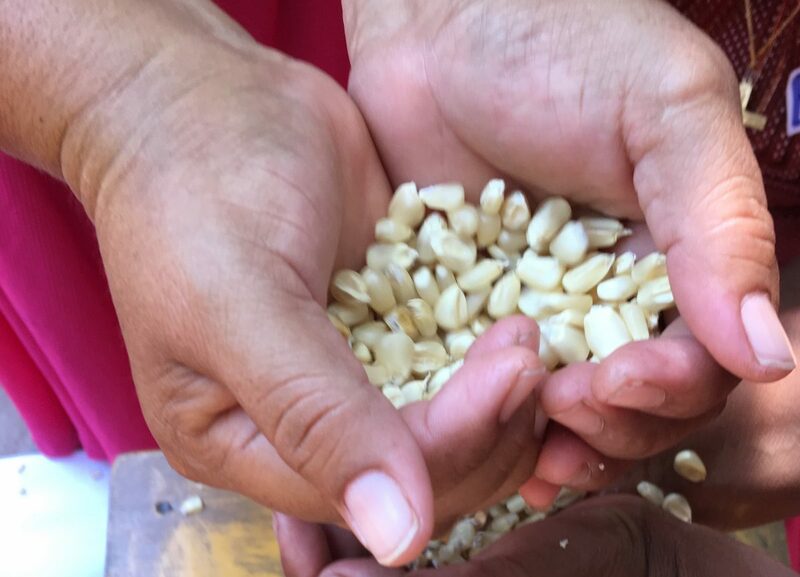 To carry out this analysis, Fuentes Libres partnered with another organization named Rural and Social Transformation (TRYSAC) to facilitate the process and I had the privilege of traveling with the team and assisting with the process. We met up at in the pre-dawn, piled into the Fuentes Libres van and made the 4+ hour trip up into the mountains and back down the other side to the coast where we were welcomed by heat and humidity. The six of us were graciously hosted by one of the families who set us up to sleep in one large room with a combination of hammocks, floor mats and two hand-made cots furbished from wood and sack-cloth. The idea is that based on the outcomes of the analysis, a thoughtful and strategic plan can be developed to accompany the community of San Mateo in the long-term process of recovery and community development. It was key, however, that the analysis was not simply an information gathering activity, but that it actually be part of the community development process. The first step was to consider what we would call this process. We had originally referred to it as a “community diagnostic”, but that sounds like a doctor identifying a problem and prescribing a solution — an important process in the healthcare, but not the intended one for a community development activity. So it was changed to the general term of “community analysis” to demonstrate the desire to understand the situation. Even more specifically, we used the Spanish word sondeo. While this word can be literally translated as a probe, in this context is more like a survey, and coming from the same root word as sound, it is intended to give emphasis to the act of listening. An asset-based approach is meant to give emphasis to the strengths and resources of the people of the community above and beyond their weaknesses and needs. 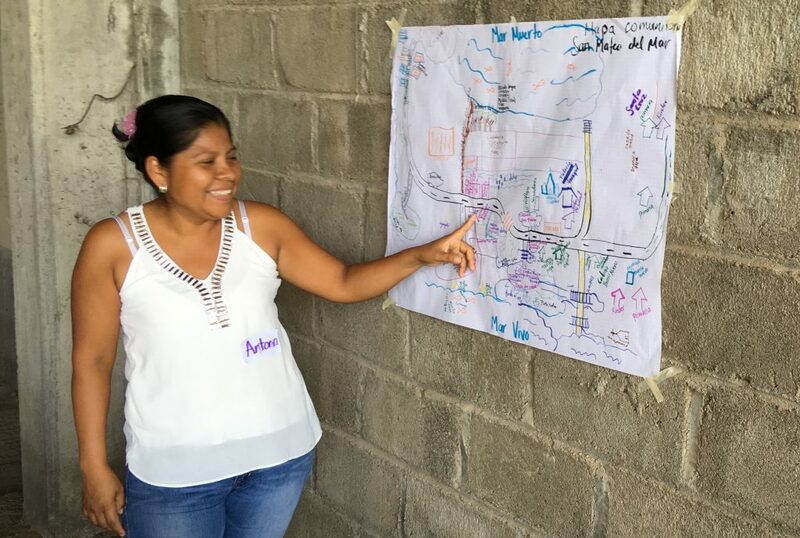 It was a joy to watch the women work together making a map of their community, identifying the resources in their surroundings such as schools and clinics, markets and churches, farm land and fishing spots. Activities such as this certainly helped us better understand the community of San Mateo, but it also was a chance for the women to recognize and appreciate their own town in a way maybe that had not done before. The leadership of Fuentes Libres recognizes that while their organization does fantastic community development, they cannot do everything themselves; thus they are are looking to partner with other organizations as they work in San Mateo for the long-term. This collaborative spirit was evident at a number of levels: as mentioned above, Fuentes Libres invited another organization, TRYSAC, to lead the facilitating of the sondeo. Also, the activities of the event themselves promoted collaboration between the women. Finally, an important actor in this collaboration is Covenant World Relief, who through their relationship with Fuentes Libres is partnering in this relief effort. And in the future, whatever nexts-steps follow as a result will almost certainly involve collaboration with other organizations and groups. A group activity promoting the collaboration over competition. By this I mean to say that it considered aspects of the economic well-being of the families involved; it considered the emotional and physical health of the women; it considered the environmental factors that have changed since the earthquake; and finally it considered spiritual health. The groups that Fuentes Libres works with are intentionally not church groups and thus participants come from a variety of different faith backgrounds. It was an honor that the women were comfortable enough with us to be open to thing such as prayer and illustrations from the life of Jesus. And finally, the sondeo is empowering. Maybe empowering would not normally be an adjective used for a community analysis or survey, but I believe that for the women who participated, having the chance to share their stories, their dreams and their ideas of how to achieve them is an empowering moment. It is a chance for them to be and feel part of the process. It was exciting to see women having a chance to lead, like the young woman pictured below who led the dialogue about the history of the community over the past 4 to 5 decades (much of which pre-dated her time). She engaged the other woman with stories of how the area has changed positively and negatively over the last couple of generations. 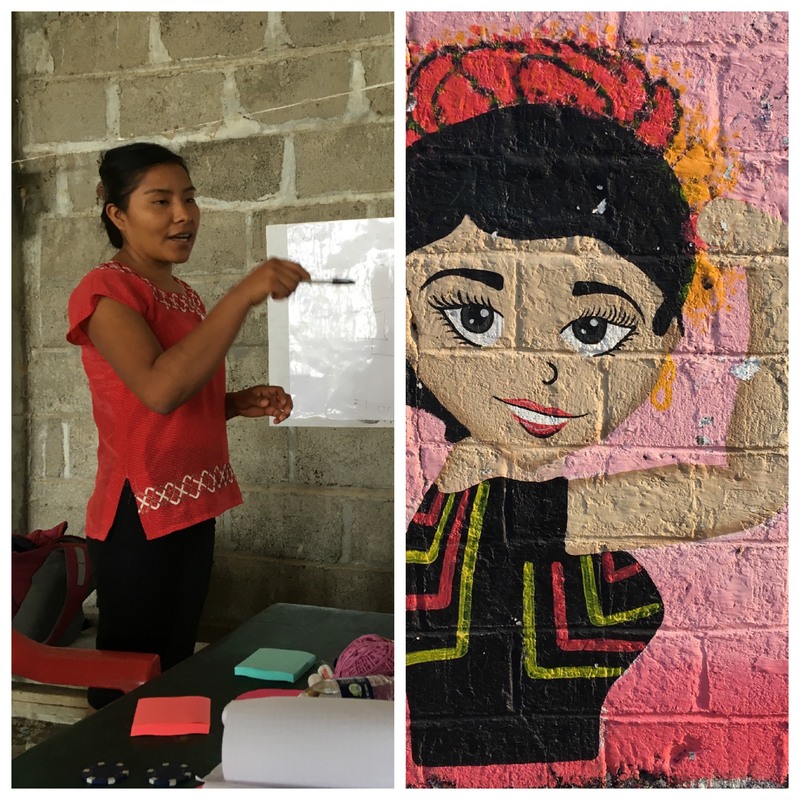 I could’t help but draw a connection between this young woman — as well as the other women of the group — and the street art just a block away depicting a Rosie the Riveter-type figure in traditional Isthmus dress. 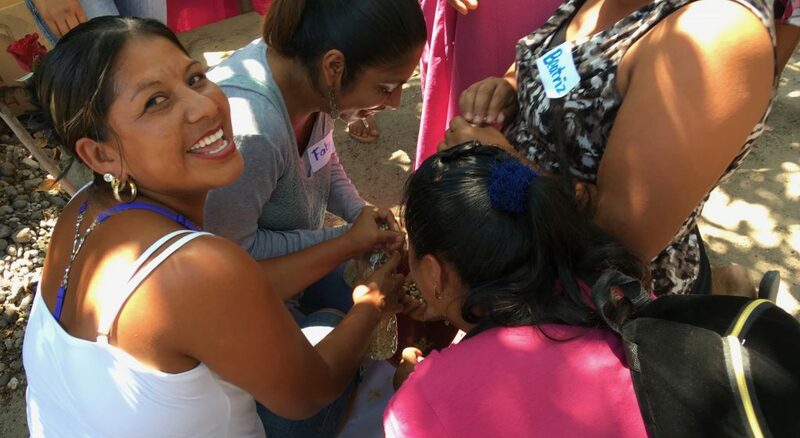 The community of San Mateo del Mar has suffered more than its share of hard hits in the past few months, but this is a strong and resilient people, and with God’s help there is no doubt that they will continue to move forward as a community — and the women will be a central part of that movement. 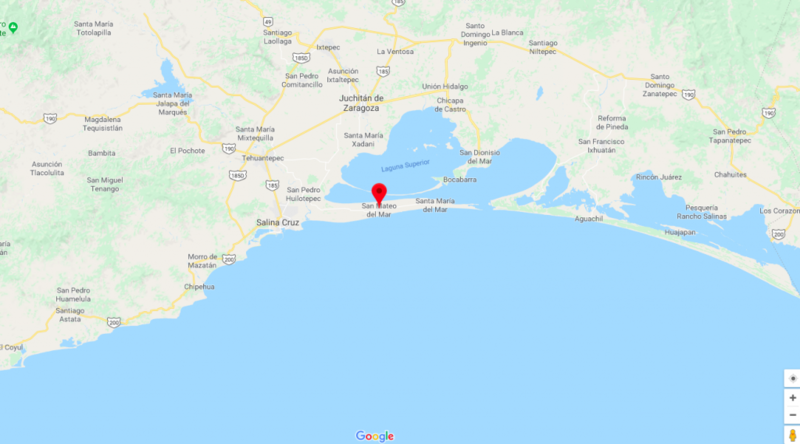 The specific next steps for how the Fuentes Libres and their partner organizations will be involved in San Mateo del Mar are still being determined. The report for the sondeo was just completed and another trip to the Isthmus will be coming soon to continue to work with the community. But I believe that with this sondeo, with its emphasis on listening, empowering, collaboration and assets-based was an important first step in accompanying the community of San Mateo del Mar in this process. Wonderful endeavor that you are participating in and co-leading. Bringing together the different organizations for one cooperative goal can be strengthening and healing. God bless you!